Getty ImagesIn the 25 largest rental markets, fewer than 19% of listings are affordable for recent college graduates. School is (nearly) out for the summer. That means millions of newly minted college graduates will strike out on their own to find a job and a place to live. Here is a guide from Trulia, an expert source for information on rentals and real estate, to help new grads find areas where they can afford the rent and still have some money left to pay back their student loans. 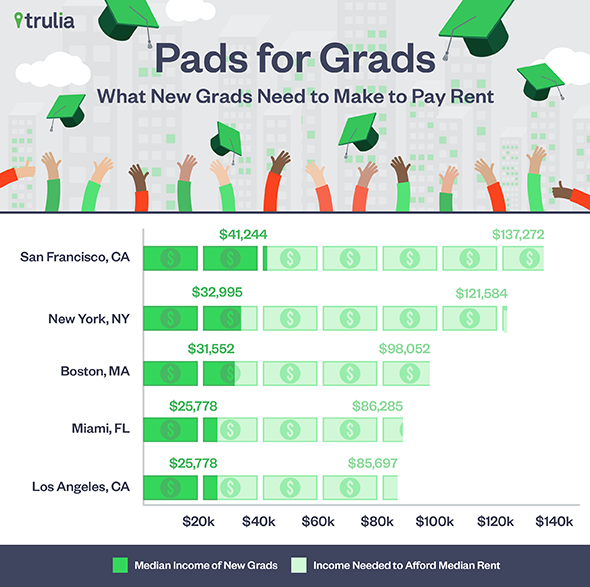 Trulia measured graduate affordability as the share of rental homes on Trulia on May 7 that were within reach of an employed college graduate who was 22-25 years old. The standard was whether the total monthly payment, including rental payment and insurance, was less than 31 percent of the metro area's median income for recent grads. Trulia calculated affordability based on the local median graduate income and rents for the 25 largest U.S. rental markets. For that reason, what was considered "affordable" for a recent graduate varied from market to market. For instance, in metro Atlanta, the median salary for a new grad is $25,571 a year. Making that much (or that little) money, you could only afford to rent a place that cost less than $661 a month, based on the 31% guideline. Sadly, that meant just 8.7 percent of the homes for rent in Atlanta (those listed for less than $661) were within reach. Affordability is even worse for new grads looking to rent in large coastal cities. TruliaThe gap between median earnings and the income required to afford the median rent is highest in San Francisco. Generally, the picture isn't pretty for recent grads who want to find an affordable place on their own. Those who head to the Midwest and the South can save the most on rent. But even in St. Louis, which topped the list of most affordable metros for new grads, just 18.6 percent of rental units were affordable. And it's all downhill from there: In the next most affordable areas, less than 15 percent of units rated as affordable. The good news is, you would need no more than one roommate to make the median rental unit affordable in each of five least expensive metros for grads. Note: Statistics are for the 25 largest rental markets. Trulia counted any fraction of a roommate needed to make rent affordable as a whole person. For example, to not break the 31% affordability criteria, a recent grad in St. Louis would need at least one roommate to make the median rent affordable. Income estimates are inflation-adjusted to 2015 dollars and originate from the 2013 American Community Survey for college educated graduates ages 22-25. Download the full dataset for the 25 largest U.S. rental markets here. If you plan to head to the West Coast after graduation, then you might want to take a crash course in sticker shock. Less than one percent of all rental units in the bottom five are affordable, and almost all are in expensive California markets. Portland (Ore.) ranks the least affordable with 0.1% of units affordable, followed by Riverside-San Bernardino (Calif.) at 0.2%, Orange County (Calif.) at (0.2%), Miami at 0.4% and San Diego at 0.4%. So what's a grad to do? Although it's an exciting prospect to get a place of your own right out of college, the cost of doing so may be too high. For those not wanting to live with Mom and Dad, there are two options: You can spend time searching for the few affordable units that are out there (Trulia can help with that) or find roommates. To help with the latter, we've crunched the numbers to find out how many roommates a recent grad would need to afford rent, and whether that means sharing a bedroom. In the five least affordable rental markets, a recent grad would need at least two roommates to make the median rental unit affordable, and in Riverside-San Bernardino, that number jumps to three. Think about it: In some cities, two individuals would need to share a room -- just like freshman year. Note: Statistics are for the 25 largest rental markets. Trulia counted any fraction of a roommate needed to make rent affordable as a whole person. For example, to not break the 31% affordability criteria, a recent grad in Portland (Ore.) would need at least two roommates to make the median rent affordable. Income estimates are inflation-adjusted to 2015 dollars and originate from the 2013 American Community Survey for college educated graduate ages 22-25. Download the full dataset for the 25 largest U.S. rental markets here. Want to live like a young professional and not like a fresh-faced graduate? You might want to think twice about moving to a high-wage metro. For recent college graduates looking to live comfortably, moving to a metro where the young and educated earn the most might be tempting. After all, in San Francisco, Washington and New York, the starting salaries for recent graduates aren't too far from the salaries of more experienced workers in other metros. These areas also have high rates of employment. So why not pack up and move to the City by the Bay, the District, or the Big Apple? Two words: high rents. Many of the metros that pay the highest salaries also come with hefty rental price tags. Here's a look at how new grads' salaries stack up to the salaries needed to afford median rents. So take notice, grads, bigger isn't always better -- 'cause that big salary may not seem so big after you start writing that monthly rent check. Download the full dataset for the 25 largest U.S. rental markets here. The lesson here for recent grads is that although it may be tempting to seek out metros with the highest wages, doing so may not necessarily lead to a better quality of life because these metros also have high rents. Recent grads need to balance both wages and rents, so such places as St. Louis, Dallas and Houston fit the bill for affordability. Although the percentage of units in these areas that are affordable is under 19%, finding just one roommate is enough to make the median-priced rental unit affordable. However, in such places as Portland and Southern California, not only are affordable units few and far between, it also takes living in dorm-like quarters to make the median priced rental unit affordable. Ralph McLaughlin is a Housing Economist at Trulia and conducts research on housing market trends and real estate search patterns. His academic background includes a degree in Regional Development from the University of Arizona and a Ph.D. in Planning, Policy, and Design from the University of California, Irvine with a specialization in Urban Development).